Openreach’s fibre to the premise (FTTP) network is now available to more than 1.2 million homes and businesses. The rollout is supported by the government, which wants 15 million properties to be connected to fibre by 2025 and wants nationwide coverage to be completed by 2033. It would then consider switching off the UK’s copper infrastructure. 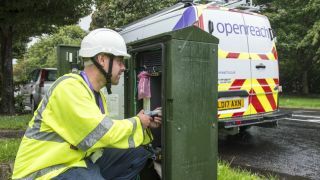 Openreach CEO Clive Selley said the company is on track to reach its initial target of three million homes and businesses by the end of 2020. In total, it is connected more than 14,000 properties every week. “Since the launch of our build programme last year we’ve made huge progress – honing our skills, tools and techniques, driving our costs down and helping our engineers to go ever further, faster and more efficiently,” he said. “Last month we announced plans for Salisbury to become the first entire city in the country to have access to our FTTP network – in what is expected to be the fastest city-wide network build in the UK. The next stage of rollout will focus on Northern Ireland, with Armagh, Bangor, Ballymena, Greater Belfast, Coleraine, Derry-Londonderry, Enniskillen, Lisburn, Larne, Newry and Newtownards all earmarked for coverage. This brings the total number of ultrafast locations up to 38.